The art of high tea food event doesn’t only depend on the fine teas and tableware or the gourmet sweets or savory collection of delights, but more for the pleasure of a leisurely afternoon with true friends, maybe some new like-minded friends, and the relaxed easy discussion amid our busy lives. High Tea is a time to enjoy fine treats as high tea food like the hand-made gourmet cookies made by Bush Cookies. Your girlfriends may think you baked these, as they are unique and tasty and like all home made favorite recipes, are made to a quality and not to a price point. Executive Chef at Bush Cookies, Aniko, commented that, “Today’s lifestyles are busy and mothers should take the time out to enjoy a first class high tea food experience with friends, at least once a month”. “Get a baby sitter. Just unwind and enjoy some simple girl talk with like minded friends”. High tea food is an experience, it’s something everyone should enjoy. Enjoying fine teas, perhaps even a quality matcha tea as an option and some glorious sweet cookies that none of your guests need to feel guilty about, because its a rare and important event. So get out your best crockery, borrow a nice teapot from your mum or your favorite aunt. Roll out that favorite tablecloth and linen napkins and order a wide variety of gourmet bush cookies for your high tea food online. The rise in popularity of high tea parties is relevant to the times and to the need for better interpersonal relations and friendly discussion. 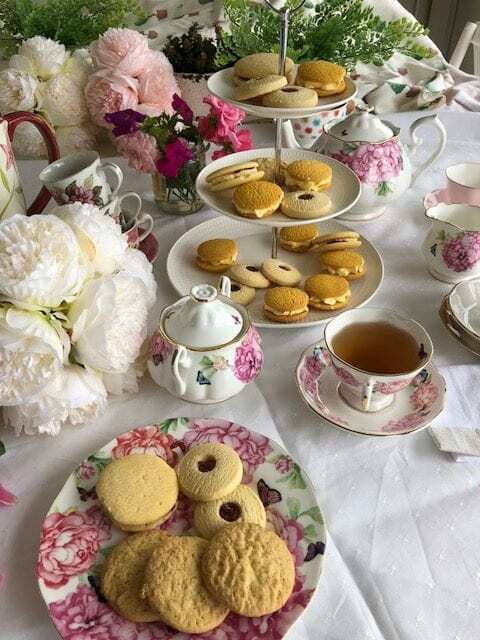 Many brides these days select high tea as a simple hen’s party option, but most often high tea is used by friends who simply wish to catch up. So, take a regular time out and treat your friends and your loved ones to an indulgent afternoon at home to experience the art of a high tea party. 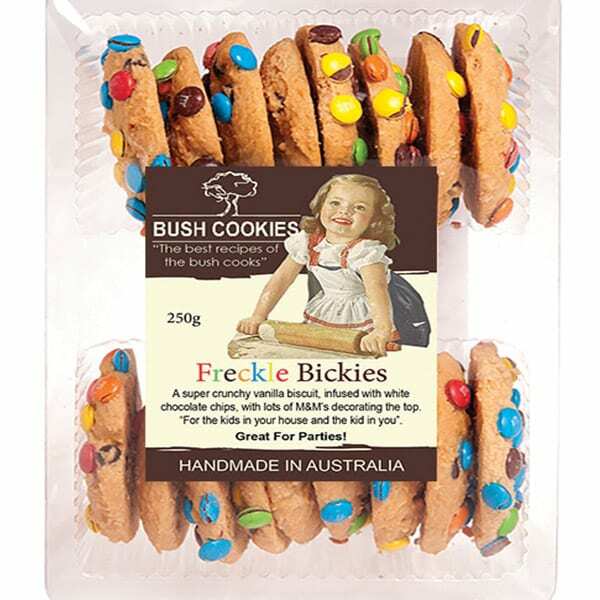 Order Bush Cookies from our parent company wholesale food suppliers Opera Foods. 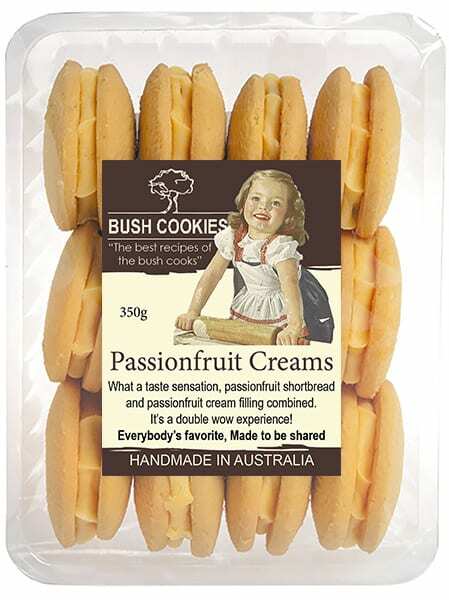 Try our beautifully creamy Passionfruit Creams. Just the right amount of bite and the right amount of passion fruit flavour in a smooth cream cookie. What is the difference between Freckle Bickies, Smarty Cookies or M & M Cookies we get asked. Well they are pretty much the same thing. Chocolate Smarties are different brand of a similar candy coated chocolate buttons product to M & Ms. Bush Cookies use colorful choc buttons in our Freckle Bickies as a variation to Chocolate Chips. Below is a basic recipe for baking either Chocolate chip Cookies, Smarty Cookies , M & M Cookies or as Bush Cookies call them Freckle Bickies. Then beat butter and sugar together in a mixer. When well creamed (when you can see no yellow peices) mix in the vanilla and the egg and beat them together. Then make little balls of dough by hand and flatten on to a cookie sheet. Bake them at 325 Fahrenheit for around 20 minutes depending on size of the cookie formations. When baked take then from the oven and cool them on the cookie sheet for a few minutes then place them on your wire cooling rack. When cooled find a quite place to gobble them by your self with a glass of milk or a cup of black tea. NOTE: Food recipes produce different results for different people, as ingredient specifications vary in different regions, stoves are not all accurate in temperature settings or air movement, and people mix the ingredients in different ways. This in not one of the Bush Cookies secret recipes, but a popular recipe published on the internet by an unknown author. 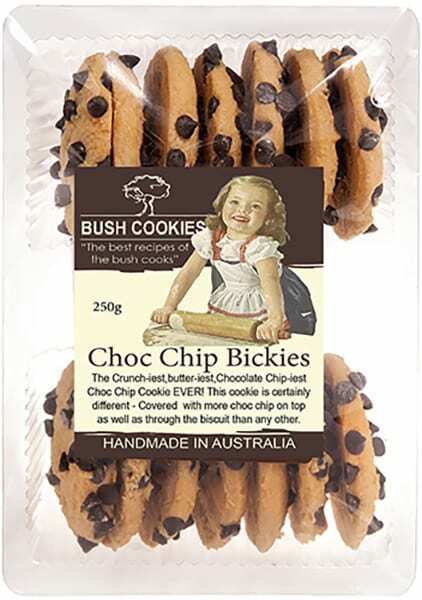 You can of course achieve a perfect cookie every time by buying a Bush Cookies Freckle Bikkie or Bush Cookies Chock Chip cookie from a gourmet grocery store near you. A super crunchy vanilla butter biscuit infused with white chocolate chips and loads of chocolate M & Ms. For the lad in our house or the lad in you. 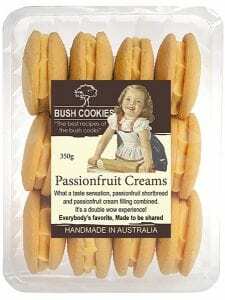 Bush Cookies the famous enough Australian manufacturer of wholesale cookies have moved from U14/ 6a Prosperity Pde Warriewood NSW 2102 to Warners Bay. 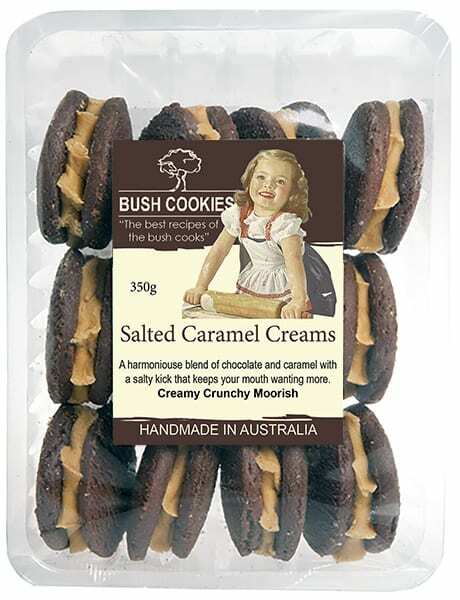 Retailers can now find Bush Cookies’ wholesale cookies at unit 3, 339 Hillsborough Road, Warners Bay NSW . Biscuits and cookies remain Australia’s favourite snack food due to their long shelf life taste and convenience. A cookie can can always give you a quick burst and hence is a popular carb. for snacking. You can still order our gourmet cookies online wholesale from our parent companies website at wholesale food distributors Australia Opera Foods. The art of decorating cookies has become a huge pastime for many crafty hosts. Hand decorated cookies are favorites at a high tea event and add to the glamor and sophistication of the event. There are of course many social events that cry out for fresh high quality hand decorated cookies. Starfish Cookies are fun to make especially for the Kiddies Lets look at cookie recipes. 2. In a large bowl, beat butter and sugar with electric beaters until smooth and creamy. Add egg and vanilla and beat until well combined. Stir in flour. 3. Roll out on a lightly floured surface until 5mm thick. 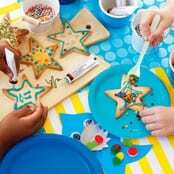 Cut out star shapes with biscuit cutters. 4. Transfer to baking tray and bake for 15 minutes or until golden. Set aside to cool completely and decorate. 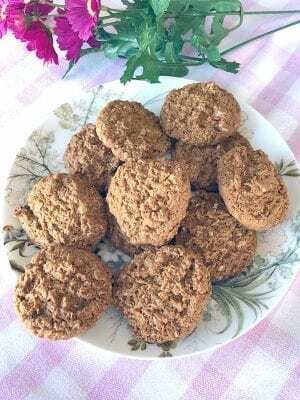 Try these yummy biscuits for your next morning or afternoon tea date. 1. Place Flora pro-activ and honey in a microwave-safe bowl and melt on 20 per cent (low) power for 30-40 seconds. 2. Place the almonds, oats and sugar in the bowl of a food processor and process for 30 seconds or until fine. With the mixer running, pour in the egg white and honey mixture and process for 40 seconds or until the mixture forms a smooth paste. Transfer mixture to a small bowl, cover and refrigerate for 1 hour. 3. Preheat oven 150°C and line a baking tray with baking paper. 4. Roughly chop the extra almond flakes and pistachios and mix well to combine. Shape the mixture into small balls and slightly flatten. 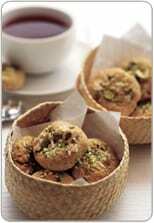 Roll in the combined almonds and pistachios, pressing the nuts firmly into the mixture. Place on the baking tray and bake for 20 minutes or until the biscuits are lightly browned. Cool on the baking tray before serving, and then sprinkle lightly with icing sugar. 5. Serve with a pot of tea. Recipe provided courtesy of Flora pro-activ spread. These classic biscuits are a simple and delicious treat. Perfect with morning or afternoon tea. 1. Pre-heat oven to 180ºC (160ºC fan-forced). 2. Mix together the oats, flour and sugar in a medium bowl. 3. Using a microwave oven or stove top, heat margarine together with golden syrup until melted. 4. In a small bowl, combine water and bicarbonate of soda then add into the golden syrup mix while stirring. ​5. Pour syrup into the dry ingredients and mix together to combine. 6. Roll a tablespoon of mixture into balls and place on baking trays lined with non-stick baking paper. Press down tops to flatten slightly. 7. Bake for approximately 13 minutes or until golden brown. Stand for 5 minutes before transferring to a wire rack to cool. NB: Recipe for the Heart Foundation provided courtesy of Lowan Whole Foods. Australia’s favorite biscuit manufacturers Bush Cookies, deliver wholesale orders of our gourmet Anzac Biscuits, freight free, to grocery retailers and cafes in major metro regions. Order now from our parent company wholesale food suppliers Opera Foods.